Recently, Girl Scouts of the U.S.A. has launched a science, technology, engineering, and math (STEM) initiative to engage girls in hands-on activities that make STEM fun and accessible and to promote gender equity in these fields by providing information and experiences highlighting the positive aspects which make careers in STEM fields attractive rather than just focusing on the need for science and math skills. 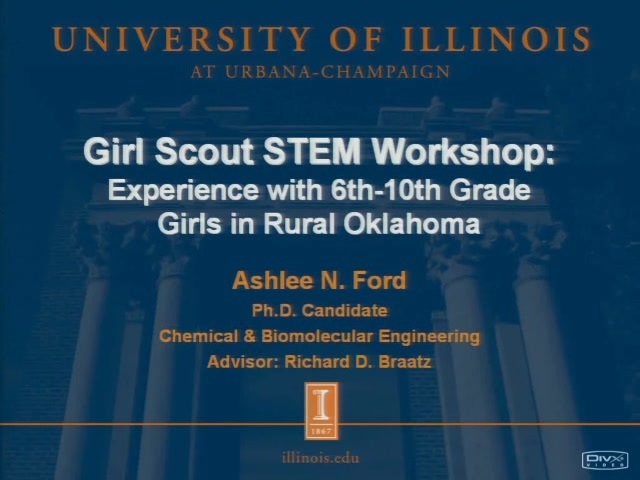 On November 26, 2008, I led a STEM workshop in Altus, OK through Girl Scouts of Western Oklahoma Council. Seventeen girls aged 11-16 from five southwestern Oklahoma schools participated in the seven hour event focused on promoting interest in chemistry and engineering. The girls were students in towns and rural communities with populations ranging from 16 to 21,500. Only 3 of the girls said that they had any prior knowledge of engineering applications and careers. This is not surprising as western Oklahoma does not have a lot of engineering jobs. The students consisted of three African American girls, 1 Native American girl, and 13 Caucasian girls. Two of the girls had learning impairments (ADHD and autism). The majority of the students were in the 7th and 8th grades (the advertised target group for the event) with just two students each in 6th and 10th grades. I introduced the engineering design process and explained different engineering disciplines to the girls. The girls formed teams and did some team building activities before moving to the engineering activities. The first engineering challenge was to work in teams to build 8-inch tall tables out of newspaper and masking tape. Information about this activity can be found on the PBS Design Squad Web site (http://pbskids.org/designsquad/projects/paper_table.html). The girls were very creative with this and were able to build very solid structures incorporating ideas about strength of materials. Next, the girls made water filtration systems using two liter pop bottles to explore concepts of wastewater treatment. Guidelines for this activity can be found on the PBS kids Web site (http://pbskids.org/zoom/activities/sci/waterfilter.html). On their evaluations of the event, several girls made comments about the usefulness of learning to filter water. They could see how this type of engineering application makes a difference in their lives everyday. After a social lunch with team members, the girls had two more activities. They first designed rubber band cars with CDs and cardboard according to the activity guide directions supplied on the PBS Design Squad Web site (http://pbskids.org/designsquad/projects/rubber_band_car.html). No group was able to successful construct a car that would actually operate according to the design. Students responded to this activity on their surveys saying they learned to Take Action “by never giving up” and “by trying to do things I think are impossible.” The day's final event was an egg drop competition. The girls were given marshmallows, spoons, straws, masking tape, popsicle sticks, and a zip top bag. They had to protect two eggs at one time, and the contraptions were dropped off the top of the football bleachers (about 30 feet). The girls loved this activity as they got to be creative, and they were eager to test the performance of their egg safety designs.